So you're getting more and more interested in mixing drinks, experiencing cocktail history via brains, ears, and tastebuds, or maybe you're reading a cocktail blog like this one and your mouth is watering to the point of no return. What do you need to get started? Here's a simple overview of what you need to start making drinks at home. I hesitate in saying "shaker" because I'm afraid that you'll feel inclined to shake everything. I say, possibly too often, DON'T shake unless you have to. You only have to shake if you're mixing juice, cream, or eggs. You'll be either shaking or stirring your drinks, but you can do both in a shaker. In fact, that's how I make all of my drinks because I have yet to find a very nice mixing containing to stir in! Don't get a plastic shaker because your drinks won't get as cold, which is a big part of why you're shaking or stirring at all. Don't go for a Boston shaker, which is basically a pint glass and a metal tin, because it takes a little more skill and will cost you a little more money. Just get a regular metal cocktail shaker, which you can find in most places, like Ikea or the Bay or probably even Winners. What should you be stirring your cocktails with? Ideally, a barspoon, which has a very small bowl and a very long handle. 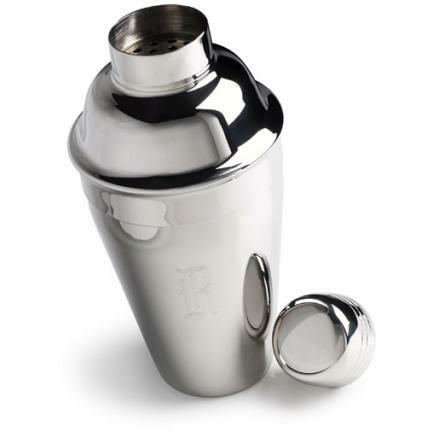 This will allow you to stir drinks in a tall mixing glass (or shaker), and also provides estimated measurements. But, you don't really need one yet. Just use a regular spoon or even a butterknife. Not classy, I know, but this is all just to get started. 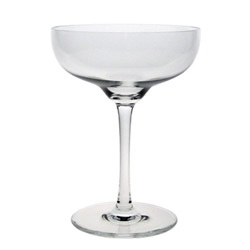 You can pick up basic cocktail glasses or Martini glasses at Ikea for 2$ each and upwards. The Bay actually has some nice ones if you feel like spending more, but go cheap to start. In the future you can start looking for some vintage glassware, which will really bring the experience together. Just the other night I made my lady a Southside cocktail - a Prohibition era drink from Chicago with supposed ties to Mob establishments - in a vintage 1940's cocktail glass I got at an antique fair. It really makes it that much more fun. But again, to start, just get something cheap and easy so you can get going. Wine glasses will do for some drinks, but hold so much liquid that it just doesn't really work when you're pouring in tiny amounts of liquid (most cocktails are 3oz or more, when a wineglass can hold anywhere between 10 and 20oz, so it just doesn't look or feel right). 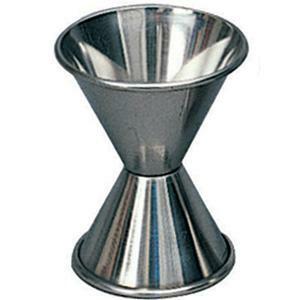 You need something to measure your ingredients with, and the best thing to get is what's called a jigger. This is a measuring tool that bartenders use for making drinks, and will either be a shot glass with written measurements, or what looks like 2 tiny cups glued together at their bases. One side is one measurement, 1/2oz or 3/4oz, for example, and the other side will be a different measurement, 1oz or 1.5oz for example. You can find jiggers where you find your glassware, Ikea, the Bay, etc, or you can get cool looking ones for cheap online. Or, you can get just a very small measuring cup from the Bay or where have you, just make sure you can measure as small as 1/2oz. Or, if you want to be super ghetoo (this is how I made all my drinks at first), you can use measuring spoons. One tablespoon is 1/2oz. This is not classy at all, but as long as you're measuring right, your drinks will be fine! A lot of classic cocktails call for juice, particularly lemon or lime juice. Do NOT use juice from concentrate or pre-made mixers. They really affect the flavour of your drink, plus they're usually full of gross chemicals. 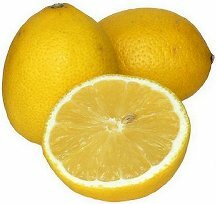 Lemons and limes are very, very cheap. Safeway has limes for 40-50 cents each, and that's nothing. You'll usually use half a lime for one drink. Getting the juice is a little trickier. A lot of recipes will ask for "the juice of one lime," but of course all limes are different sizes and this doesn't really help you make consistent drinks. I suggest picking up a juicer. I got mine from the Bay for about $10, and it's been incredibly useful. You can juice your fruit, then pour out of the juicer to measure. A lot of cocktails call for "simple syrup." All this is, is one part sugar dissolved into one part water. Just simmer or boil the water in a pot on your stove and the sugar will dissolve. Throw this in any kind of empty bottle - soda, wine, booze, or you can pick up bottles with pour-spouts at the dollar store or something similar. Using simple syrup instead of granulated sugar makes a world of difference in your cocktails because you know that you're getting the full amount (where some sugar won't dissolve in your drink, leaving less sweetness than needed), and of course, getting granules of sugar in your mouth while sipping is not fun. Again, literally all you do is simmer say 1 cup of sugar in 1 cup of water on the stove and pour into some sort of container. Keep it in the fridge in the meantime. I'm actually going to separate this into a different post, because it's more in depth. Obviously, you need booze to make cocktails. It can be a little daunting to know where to start, but I'll go through the basic few bottles you should pick up, where to get them, and how much they'll cost. Even with a bottle of gin, a bottle of vermouth or fortified wine, a bottle of bitters, and some sugar and juice, you can make a range of cocktails. So, not including booze, you've spent let's say $40 on a cocktail shaker, a jigger, 2 cheap glasses, and a jigger. Add in $5 or so for some limes and lemons and sugar. Your only other expense is the alcohol, and you're ready to start enjoying cocktails!